Tri-Cities employers added 500 jobs in November. The unemployment rate dropped to 5%, and the jobs growth rate continued trending lower. Since the base data for these charts is the preliminary, nonadjusted monthly data from the BLS there is a slight revision each month. Those corrections are incorporated into the chart data which is computed with a three-month moving trend to illustrate a trend line. Clicking on the chart renders a larger file. Preliminary, non-adjusted nonfarm job growth for the seven-county region was up 0.2% from last year. Job creation turned positive 18 months ago, peaked in March and has slowly drifted lower since them. So far this year, employers have averaged adding 482 jobs a month. The growth is in line with the national labor market, but locally it’s still 1,600 jobs short of the pre-recession high. And the growth pattern isn’t equally shared by the region’s two Metropolitan Statistical Areas. The three-county Johnson City MSA has been slow to recoup the hit it took during the recession. But job creation in that area has out-performed the four-county Kingsport-Bristol MSA for the past four months. And its monthly totals for September, October and November have been equal to or barely below a pre-recession high. Kingsport-Bristol’s job total is still 1,500 jobs shy of its pre-recession high and it lost ground in October and November. Average private sector wage status is listed as “not available” for every Metropolitan Statistical Area in the state except Knoxville and Nashville. There’s no explanation on the Bureau of Labor Statistics site, but it looks like an adjustment that goes back to October 2012 is under way. 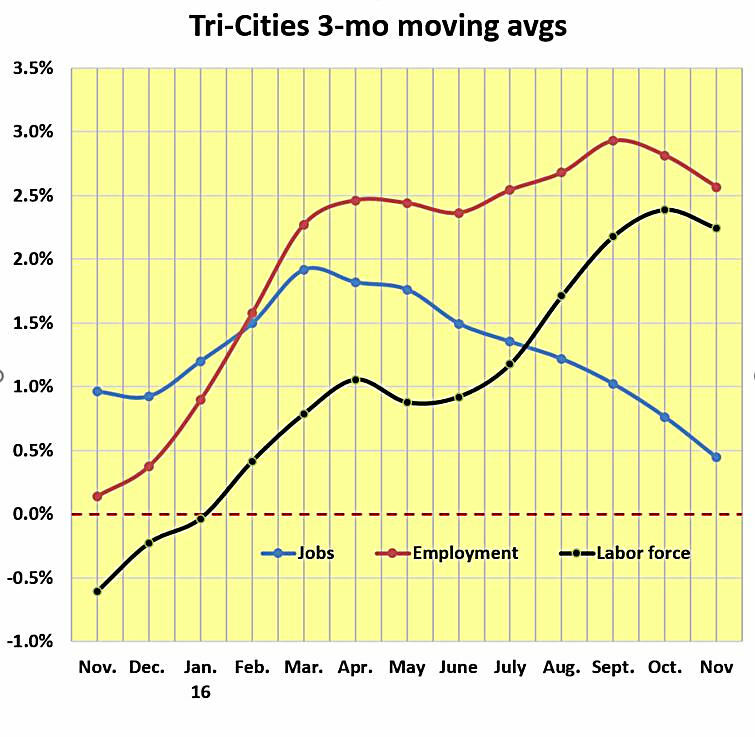 November’s Tri-Cities 5% unemployment rate was a five-month low. Employment began picking up in June, peaked in September then synced with the sinking job creation growth rate by trending lower in October and November. The survey used to get the unemployment report is the less accurate labor market indicator, and the rule of thumb is when employment trends in the opposite director of job creation go with the job creation rate. November’s employment for the region was down 16,667 from the pre-recession benchmark. Much of that can be attributed to the number of people who are no longer in the labor force. There were 18,427 fewer people in the labor force in November than there were in November 2008. According to 2015 Census data released a few months ago, almost 46% of the working age people in the Tri-Cities are not in the labor force. Some of the low labor force participation rate is due to the rapidly aging population. The Tri-Cities is on the leading edge of that demographic dynamic slowly beginning to grip the nation. Another driver is some of the local workers who lost their jobs during the recession do not have the skill sets employers are now seeking. Education efforts have been stepped up, but correcting this structural issue of underemployment in the local labor market is a slow process at best. That’s why it’s more accurate to describe the current labor market and overall economy as a reset from the Great Recession rather than the “recovery” term commonly used by well-meaning media. Here’s a capsule view of the jobs, employment and unemployment rates for the region’s two MSA, and employment and unemployment rates for the three major cities. Unemployment rate – 5.1% – down 0.2%. Unemployment rate – 5.2%, down 0.6%. Unemployment rate – 5.5%, unchanged from October.